Carsen Twarynski on the ice for the Flyers during a preseason game last year in Allentown. After a 45-goal season in the Western Hockey League, winger Carsen Twarynski is getting ready for his first pro season. The 6-foot-2, 198-pound Calgary native is ticketed for the AHL's Phantoms, for whom he scored a goal during a five-game stint late last season. "I think the pace is definitely higher," said Twarynski, a blossoming power forward whom the Flyers drafted in the third round in 2016, "but at the same time, everyone's positioning is sound. They're all where they should be all the time. That makes it a bit easier. All the passes are on the tape, and when you need someone's support, they're there." "Obviously, my only goal is to try to get a roster spot with the Flyers, whether it's a full year or getting sent down to the 'A' at the start of the year and then earning my spot halfway through the year or getting called up and down," he said. "I just want to make strides for myself in that sense where I can earn a spot and try to show my ability to help the team win and help the team eventually have a good playoff run and get to the Stanley Cup Finals." Twarynski, who will turn 21 on Nov. 24, is among an impressive group of forwards at the Flyers' rookie camp, which will conclude with a game against the Islanders' prospects at 6 p.m. Wednesday in East Meadow, N.Y. In Wednesday's matchup, Twarynski is expected to be on a line with Oskar Lindblom and center Mikhail Vorobyev. 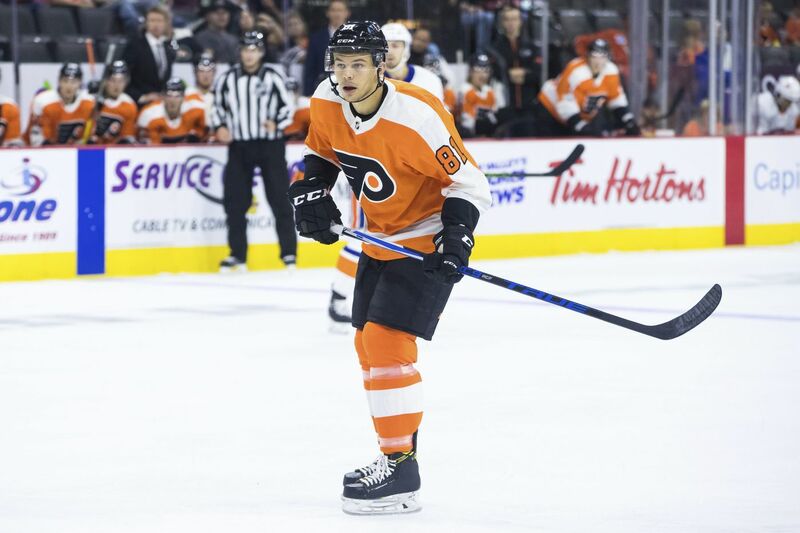 Lindblom is expected to be the Flyers' third-line left winger this season, and Vorobyev is a long shot to win one of the bottom-two center spots. Twarynski has been alongside Vorobyev in camp, and he had high praise for the center, a solid defender who had nine goals and 29 points in 58 games with the Phantoms last season. "He's very good with protecting the puck," Twarynski said. "Most European and Russian players are. They grow up learning that the puck-protection game is really important, and he thinks the game really well. He's really easy to play with in that sense because I know where he's going to be and know what he's going to be doing. He has very good hockey sense." Vorobyev, 21, a fourth-round selection in the 2015 draft, said the biggest adjustment to North American hockey was the speed and physicality in the games. "I like the way he sees the ice," said Slava Kouznetzov, the Flyers' skating coach and Russian translator. He said that Vorobyev's skating has improved and that he is a solid playmaker. "I love the way he moves the puck. He's not hogging the puck, but he can feed the pass from [anywhere]," Kouznetzov said. "And he's started shooting the puck more, so he's become much more dangerous." Isaac Ratcliffe on the ice during a preseason game last year. Wednesday, Morgan Frost is expected to center Isaac Ratcliffe and Maksim Sushko. In 2017, the Flyers drafted Frost in the first round, Ratcliffe in the second round, and Sushko in the fourth round. "Those two are highly skilled guys," Ratcliffe said of his linemates. "They know where you are on the ice, and it's easy to find them, too. They make plays really well, and you just need to find the open ice and they'll get the puck to you. They're definitely offensive-minded, but they play the full ice; they play that full three-zone game." This is Ratcliffe's second year playing in the rookie game. "I'm a little more comfortable this year," said the 6-6, 200-pound Ratcliffe, who had 41 goals in 67 Ontario Hockey League games last season. "Definitely really excited to throw on the Flyers jersey for the second time. I mean, it's always exciting to play in front of some family and fans, and you get those little chills." Ratcliffe, 19, is headed for another year of junior hockey but is viewed as an integral part of the Flyers' future.